The difference in the fullness of your plate during finals and after finals is so vast, it can leave you wondering how the same brain functions in both worlds. 1. During finals, each minute of your day is so crammed with tasks that you begin to question the logic of final exams altogether, wondering what spawn of Satan came up with saving all your hardest tests for the same week. After finals, your agenda is suddenly empty and you instead spend your time staring into your dog’s eyes and wondering what it thinks about all day. 2. During finals, your stress level propels you to wake up two hours early so you can get a start on three different study guides. After finals, you allow the entire day to pass by before you tackle your one goal of the day: empty the dishwasher. 3. During finals, the thought of taking part in necessary life tasks like eating, sleeping, and exercising is purely comical. After finals, your day is centered on these activities and usually drawn out to fill the absolute maximum amount of time. 4. During finals, your brain is overwhelmed with equations, theses, and concepts, and you can’t spare any space for thoughts regarding actual life. After finals, you have so much time to self reflect that you begin to figure out exactly what went wrong in all your past relationships—then promptly deny it. 5. During finals, your laptop is huffing and puffing after hours of writing essays and lab reports. 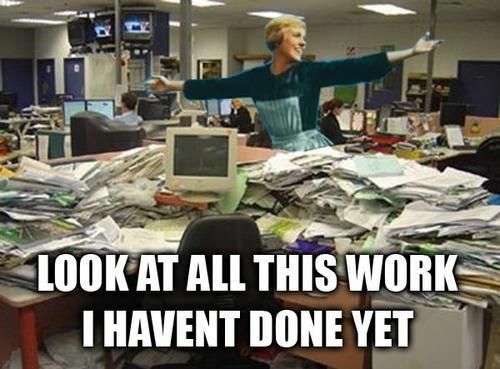 After finals, its doing the same thing except from exploring Pinterest and finally adding Facebook photos from homecoming week. 6. 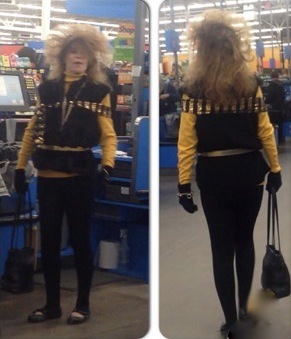 During finals, the concept of even brushing your hair in the morning seems unnecessary. After finals, you see that selfie you took at the library studying and vow to always have a comb on hand. 7. During finals, the thought of putting on a real pair of pants sounds more unappealing than getting your legs waxed. 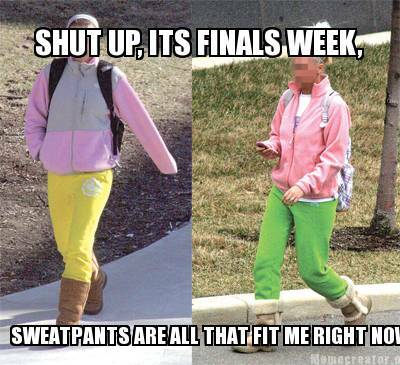 After finals, your body still craves the loose fit and snuggly feel of your sweat pants. Unfortunately after finals week the ‘just rolled out of bed look’ is no longer acceptable and will only be seen as lazy. 8. 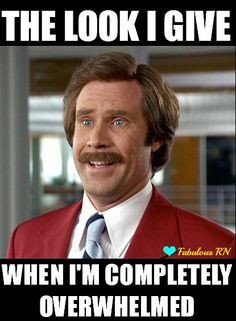 During finals, coffee basically replaces the blood in your veins as you pray to God that just one more espresso shot will keep you awake without sending your heart into cardiac arrest. After finals, you measure the value of your coffee on flavor and feelings of serenity rather than the amount of energy in gives you. 9. During finals, lack of sleep can lead to extreme sensitivity. You find yourself wanting to punch your roommate over not washing the dishes or about to cry when you can’t find a synonym for perturbed. After finals, your brain is restored by adequate, if not an overly excessive, amount of sleep. You find yourself feeling balanced, energized, and ready for any emotional challenge so you devote hours of your time to talk to your BFF about everything that was wrong with her ex boyfriend. 10. 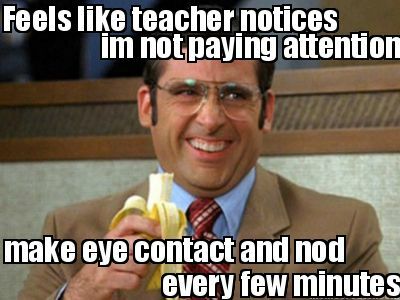 During finals, almost everything you encounter becomes a distraction. Did you notice how the clouds move when it’s windy? Wow, my pen is very shiny! Have my toes always been this asymmetrical? After finals, meager life occurrences are much less significant. The symmetry of your toes just doesn’t seem significant and who has time to admire the clouds when you’re about to beat another level of Candy Crush? 11. 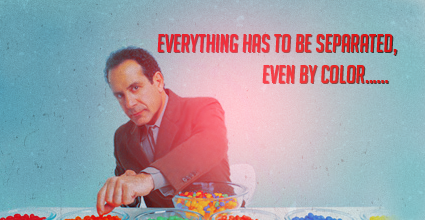 During finals, your perception for anything else other than studying reaches Adrian Monk status. You begin to notice how the crumbs collect behind your refrigerator, how you never replied to your aunt’s email, and how the mole on your back is most likely cancer. After finals, your brain isn’t searching for anything to take you away from studying, resulting in the return of your normal perception skills: not noticing you put the jelly in the pantry and the peanut butter in the refrigerator. 12. During finals, visiting Qdoba two times in one day is a must. Queso always gives you the best ideas. After finals, visiting Qdoba two times in one day may not be a must, but is still acceptable. 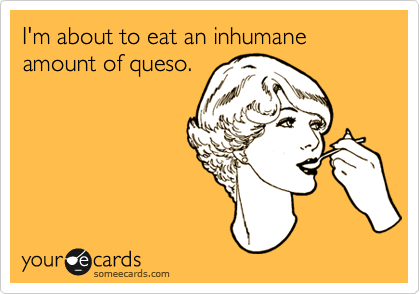 Queso is always a good idea. 13. During finals, you want to kick yourself for not paying attention in class. 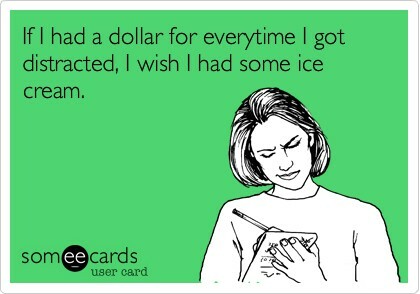 You wonder how you managed to daydream during 3 hours of class per week. After finals, this anger disappears and you begin your new classes by practicing your signature hundreds of times and pondering how Jesus was Jewish. As you always say, that’s Future [insert name here]’s problem. You’re prepared as ever to get to your favorite study spot in the library and get all your pre finals preparations done before your first exam. Oh wait every student and their mother decides to show up and leave you on the floor. If you feel the need to talk on your phone and not leave the quiet room then just expect bad looks all around. I personally suffer from this annoyance but not many things more annoying than watching someone scroll through their Facebook feed but you have no recent posts forcing you to actually do what you went to the library to do. I came to the library already thinking about the nap I’m going to take after I read these 100 pages the night before an exam but your snoring is really not helping. Yes we know how much you love each other by the way you’re struggling to un-suction cup your faces but we actually came to study. Thanks for keeping your clothes on. Mother’s Day just around the corner and just about every mom loves to get a beautiful bouquet of flowers that say I love and appreciate you…or do they? Here is your ultimate guide to flower meanings so you can express exactly how you feel this Mother’s Day! The carnation , scientifically known as Dianthus caryophyllus, is a historically rich and meaningful flower choice. Its scientific name, dianthus, roughly translates to “flower of love” or “flower of the gods”, depending on the source. One of the world’s oldest cultivated flowers, the carnation is appreciated for its ruffled appearance, clove-like scent, and extended blooming period. The meanings of carnations include fascination, distinction, and love. Like many other flowers, different messages can also be expressed with the flower’s different color varieties. Light red carnations, for example, are often used to convey admiration, whereas the dark red version expresses deeper sentiments of love and affection. White carnations are associated with purity and luck, and pink carnations are often given as a sign of gratitude. Roses are known for their simple beauty and intoxicating fragrance. There’s no better way to send a heartfelt message than with the classic rose. Each color rose has its own special significance, though, read on so you choose the color to perfectly complement your message, whether it’s love, friendship or remembrance. Red Rose Scottish poet Robert Burns didn’t compare his love to a red, red rose for nothing. Long associated with beauty and perfection, red roses are a time-honored way to say “I love you.” Whether it’s for a birthday, Valentine’s Day or just to express appreciation on any old day, there’s no better way than a bouquet of red roses to express your feelings. Pink Rose Pink roses are fabulously versatile when you have something important to say. A classic symbol of grace and elegance, the pink rose is often given as a token of admiration and appreciation. Whether they’re for your best friend, fiancée or ever-dependable cubicle mate, a pink rose bouquet will create a bright spot in a special someone’s day. Orange Rose With their blazing energy, orange roses are the wild child of the rose family. Whatever feelings you might be bubbling over with—enthusiasm, passion, gratitude—orange roses will get the message across with both oomph and elegance. Gerbera daisies can mean innocence, purity, and cheerfulness. These large daisy variations come in a number of vibrant colors, and sending them is the perfect way to brighten someone’s day. Tulips are a comfortable flower choice and one that expresses general love. The is one of the world’s most easily recognized and loved flowers. The meanings of tulips coupled with the immediately identifiable shape of their colorful blooms make them a comfortable flower choice. They are not too elegant, too romantic, too big, too small, or too bright; the tulip is always just right. They are like a favorite pair of jeans or your mom’s fresh-baked cookies in that the meanings of tulips express genuine coziness and comfort in all of the right ways. With their delicate, sculptural beauty and historical rarity, orchids carry an unrivaled suggestion of refinement. The exotic flowers are now cultivated in a wide variety of colors and delicately shaped blossoms, making them beautiful both on their own and as an addition to arrangements, but they retain their association with very special occasions. With an estimated 25,000 different types existing naturally, orchids are of the largest flowering plant families, but they have always carried an impression of rarity. Their exotic mystique and otherworldly beauty was irresistible to the Victorians, who collected and displayed them like treasures. Consequently, they became a sign of luxury and refined tastes. Different cultures throughout history have believed in the healing, disease-fighting and protective properties of the orchid. In traditional Chinese medicine the orchid is used to help cure coughs and lung illnesses. The ancient Greeks associated it with virility, and the Aztecs were said to drink a mixture of the vanilla orchid and chocolate to give them power and strength. As the flowers most often associated with funerals, lilies symbolize that the soul of the departed has received restored innocence after death. Unless they’re your mom’s favorite, I would skip these for Mother’s Day.